I’m a very patient person…when it comes to other people. When it comes to myself…not so much. Labor Day weekend – less than two weeks ago – I went to New York for a weekend with my mom and sister. It was a great weekend, but I sure am tired from it – still, two weeks later. It’s so frustrating. During my breast cancer treatment, many doctors kept telling me that exhaustion was one of the top three side effects from both chemo and radiation. I get that. They pumped my body with toxic drugs and high levels of radiation, so I should be tired. During treatment, I came home after work and took a nap, woke up for dinner, then went to sleep for 10 hours. I was sleeping about 12 hours a day. I was fine with that. I’m a really good sleeper. And that’s what my body needed to survive. But now it’s almost nine months since I’ve been done with treatment. People tell me that it takes a year to get back to 100% of your regular energy level. So I’m trying to be patient as I still have three more months until my one year mark. But it sure is hard to wait for that time to come around. I want to go back to doing all my normal stuff – strenuous exercise, going out at night with friends, spending the day out and about, walking around museums – but my body just isn’t there yet. I know, I know…I’ve been through a lot, both in body and mind. I should cut myself a break and be patient. But that’s easier said than done. The last two weeks I could barely make it through an eight hour day of work. By the time I got home and made dinner, I was ready for bed. And that’s after spending the weekend sleeping in late, taking lots of naps during the day and going to bed early. And that wasn’t enough. I’m still tired. I’m hoping this weekend will be my final weekend of resting so I’m not exhausted. I’ll again sleep in, take a nap and go to bed early. Hopefully that’ll help get me to the point of just being a little tired, rather than completely exhausted. I know what you’re going to say…you have to listen to your body and it just needs more time to recover. But why does it have to take so long? 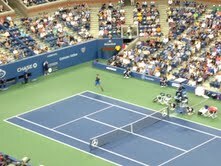 This past weekend I went to New York to spend time with my mom and sister, and watch the U.S. Open. It’s our annual Labor Day weekend tradition. We’ve been doing it for about 7 years. Last year at this time I was in the middle of chemo, so clearly I wasn’t gonna make it to New York. 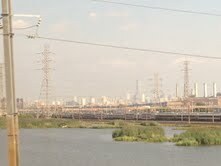 On the train ride up to New York I got a bit teary thinking about how happy I was to be able to resume this tradition. This weekend with my mom and sister was the first time the three of us have been together since my mastectomy surgery last year. On the train ride I started to think about all the times my mom and sister came to visit me last year, to help me through surgeries and chemo treatments. The tears came again when I thought about how grateful I was to be getting together for something fun and happy. There’s something special about New York that makes me feel alive. There are so many people – so many different kinds of people. The hustle bustle of the city is so vibrant. There’s really no other place quite like New York. I love it. My trip to New York couldn’t have come at a better time. It reminded me that life can feel normal at times. It was hot and humid in New York. My chemo curls were really getting a work out. But I was just so happy to have hair, I didn’t really care how crazy it looked. 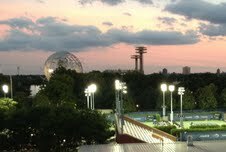 My mom, sister and I went to watch two nights of the U.S. Open. The nights were warm, with a gentle breeze that helped keep things comfortable to sit outside for hours. It kept my hot flashes to a minimum. That was greatly appreciated. We got to see Roger Federer, one of my favorites. He played an almost flawless match, barely giving his opponent any chance of coming close to winning a set. I didn’t really care whether it was a great match, I was just happy to be there, literally happy to be alive to be watching tennis again with my mom and sister. I also got to spend time with a couple of my oldest and dearest friends. Over the last year and a half I’ve been reminded that I’m lucky to have many good friends and family members that support me through life’s challenges. Any chance I get, I want to spent time with these people. It feeds my heart. For me, life is now about nurturing the deep connections with the important people. After three nights in New York, I got home exhausted. But it felt so great to be exhausted from having too much fun – staying out later than I have in over a year and a half, walking around all day long and warm summer nights. The activities that used to make me exhausted were surgeries and treatments. What a nice change that is.